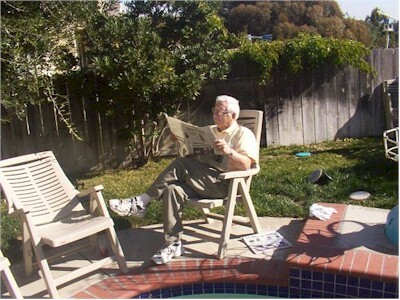 One couldn't read the paper by the pool quite as comfortably back in New England. We spent a nice day around the house today. Dad, Bayley, and I took a long walk around the neighborhood. Mom and I looked at (and scanned) old photographs for much of the day. Susan made Cindi's lasagne for dinner, then Matt went out with some friends and Scott played some trombone with Dad accompanying on piano.